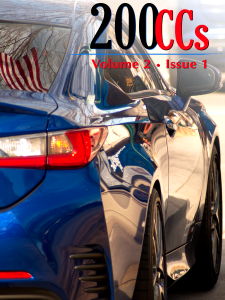 200 CCs are 200 word short stories. I featured about 60 of them here before letting my attention drift elsewhere. But I liked the format and I wanted to post more. Unlike other microfiction formats they aren’t hard limited to their word counts (no more, no less). They should fall between about 185-215 words, though, or they become something else. 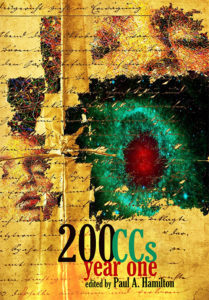 200 CCs: Year One print anthology is on sale now! Collects Volumes 1 & 2 into a single paperback edition with gorgeous cover art by contributing author Amanda Bergloff and an introduction by Vajra Chandrasekera. 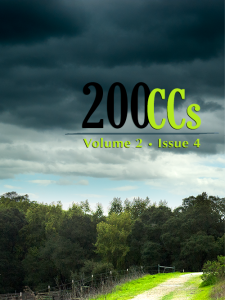 All proceeds go toward funding future 200 CCs projects. 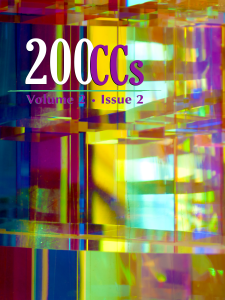 If you like 200 CCs and want to see more, treat yourself to a copy and encourage others to pick one up for themselves. 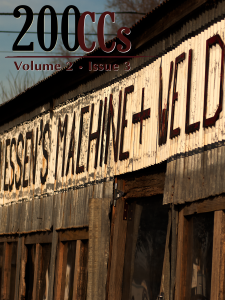 Includes stories by Scarlett R. Algee, Nicholas Antoniak, Elizabeth Archer, Davian Aw, Michael Balletti, Amanda Bergloff, R.L. Black, Mickie Bolling-Burke, Nikki Boss, Constantine de Boudox, Karen Bovenmyer, Maureen Bowden, Tara Bradford, J. Bradley, Anne Lawrence Bradshaw, Laura J. Campbell, Shenoa Carroll-Bradd, Pamela Hobart Carter, Gregg Chamberlain, Vajra Chandrasekerea, Alex Creece, Carrie Cuinn, Christina Dalcher, Dominic Daley, Danielle Dreger, Alethea Eason, Allison Epstein, Brendan Foley, Ron Gibson Jr., Will Gilmer, Georgene Smith Goodin, Alex P. Grover, Sophie Hammond, Anna Hawkins, Charles Hayes, Russell Hemmell, Kyle Hemmings, Jinapher J. Hoffman, Liam Hogan, Simon Hole, Isobel Horsburgh, Katta Hules, Adiba Jaigridar, Soren James, Rita Jansen, Anne E. Johnson, Sierra July, Jeaninne Escallier Kato, Maxine Kollar, Stephanie Kraner, Jena Krumrine, Nolan Liebert, Daniel Lind, E.N. Loizis, L.L. Madrid, Erick Mancilla, Ruchira Mandal, Alison McBain, Kathryn McBride, Ville Meriläinen, James A. Miller, Kris Miller, Sean Mulroy, Joseph Musso, Garth Pettersen, Alice Pow, R. S. Pyne, Howard Rachen, Ahimaz Rajessh, Eliza Redwood, Alexandra Renwick, Alyson Rhodes, Laura Roberts, C.C. Russell, Casi Scheidt, Holly Schofield, Dimple Shah, T. L. Sherwood, Steve Spalding, William Squirrell, Tasha Teets, Clive Tern, Natalia Theodoridou, Monika McGreal Viola, Christopher Walker, Deborah Walker, Jessica Walker, Jake Walters, Anne Elizabeth Weisgerber, Megan Wildhood, and Sheri White.